Entertainment-Education and Social Change introduces readers to entertainment-education (E-E) literature from multiple perspectives. 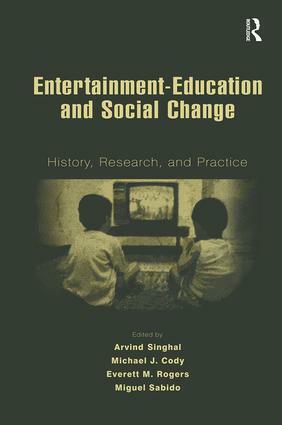 This distinctive collection covers the history of entertainment-education, its applications in the United States and throughout the world, the multiple communication theories that bear on E-E, and a range of research methods for studying the effects of E-E interventions. The editors include commentary and insights from prominent E-E theoreticians, practitioners, activists, and researchers, representing a wide range of nationalities and theoretical orientations. Examples of effective E-E designs and applications, as well as an agenda for future E-E initiatives and campaigns, make this work a useful volume for scholars, educators, and practitioners in entertainment media studies, behavior change communications, public health, psychology, social work, and other arenas concerned with strategies for social change. It will be an invaluable resource book for members of governmental and non-profit agencies, public health and development professionals, and social activists. Contents: Preface. Part I: History and Theory. A. Singhal, E.M. Rogers, The Status of Entertainment-Education Worldwide. D. Poindexter, A History of Entertainment-Education, 1958-2000. P.T. Poitrow, E. de Fossard, Entertainment-Education as a Public Health Intervention. M. Sabido, The Origins of Entertainment-Education. A. Bandura, Social Cognitive Theory for Personal and Social Change by Enabling Media. W.J. Brown, B.P. Fraser, Celebrity Identification in Entertainment-Education. S. Sood, T. Menard, K. Witte, The Theory Behind Entertainment-Education. Part II: Research and Implementation. S. Usdin, A. Singhal, T. Shongwe, S. Goldstein, A. Shabalala, No Short Cuts in Entertainment-Education: Designing Soul City Step-by-Step. W.N. Ryerson, N. Teffera, Organizing a Comprehensive National Plan for Entertainment-Education in Ethiopia. B.S. Greenberg, C.T. Salmon, D. Patel, V. Beck, G. Cole, Evolution of an E-E Research Agenda. V. Beck, Working With Daytime and Prime-Time Television Shows in the United States to Promote Health. M. Bouman, Entertainment-Education Television Drama in the Netherlands. M.J. Cody, S. Fernandes, H. Wilkin, Entertainment-Education Programs of the BBC and BBC World Service Trust. A.C. La Pastina, D.S. Patel, M. Schiavo, Social Merchandizing in Brazilian Telenovelas. E.M. Rogers, Delivering Entertainment-Education Health Messages Through the Internet to Hard-to-Reach U.S. Audiences in the Southwest. Part III: Entertainment-Education Interventions and Their Outcomes. R.A. Abdulla, Entertainment-Education in the Middle East: Lessons From the Egyptian Oral Rehydration Campaign. Y. Yaser, The Turkish Family Health and Planning Foundation's Entertainment-Education Campaign. N. McKee, M. Aghi, R. Carnegie, N. Shahzadi, Cartoons and Comic Books for Changing Social Norms: Meena, the South Asian Girl. A. Singhal, D. Sharma, M.J. Papa, K. Witte, Air Cover and Ground Mobilization: Integrating Entertainment-Education Broadcasts With Community Listening and Service Delivery in India. A. Singhal, Entertainment-Education Through Participatory Theater: Freirean Strategies for Empowering the Oppressed. T. Tufte, Soap Operas and Sense-Making: Mediations and Audience Ethnography. J.D. Storey, T.L. Jacobson, Entertainment-Education and Participation: Applying Habermas to a Population Program in Nepal. Epilogue.